I posted a few weeks ago about preparing for the more secular parts of the season. Now it’s time to share the important things! We love Christmas around here. We love listening to the carols and hymns, we love reading the scriptures, and we love talking about Jesus. Here are some of the ways we’re making sure we remember the reason we celebrate Christmas in our home this year. This year, we’re also doing the Jesse Tree advent devotionals as a family. I did a swap with my MOPS group where we each made 25 of one type of ornament, and then divided them all up so we had each one. I think it’s so special to have handmade ornaments from some of my sweetest friends – I know i will cherish them forever. We’re using this book, The Advent Jesse Tree, by Dean Lambert Smith. It’s our first year to use it, and some of my friends ended up buying different ones, but I’ve really loved this one. It has all of the relevant scripture noted, plus two or three suggestions of hymns or songs to sing each day. Another thing I love about it is that for each day it has a child devotional, which has been perfect for my preschoolers and my older son, plus an adult devotional to dig a little deeper. We’ve all learned a lot, and have spent some really special family time doing it. On Christmas morning, the first thing we’ll do is read the Christmas story in Luke 2, and pray together. I’ll also wrap up Jesus from one of the nativities (or maybe the Jesus ornament from the Jesse tree) to be the first gift we open, so we make sure to talk about how what matters is our Savior, and not the presents. 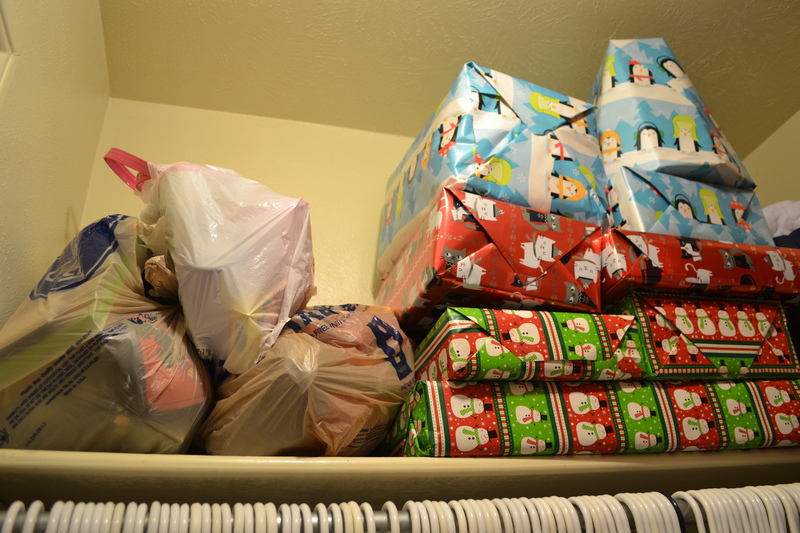 This Christmas, we’re also going to try to take a break in the morning to bless someone else. The tentative plan now is to look at our stocking goodies, and then go take breakfast to another family or individual. We won’t stay long (unless they want us to), but share a little Christmas love and try to remember that it isn’t all about us. We also keep our Christmas cards throughout the year to pray for the families who sent them. So, what does your family do to keep the reason we celebrate Christmas in the forefront of your minds? I already explained that we do a simplified version of Santa here. I think it’s a sweet tradition, rooted in Christian history. As I was making our shopping list for next week (next week?!?!? ), I realized I needed to make sure I have what we need to make cookies for the man in red. We make this same recipe every year, and it’s perfect! 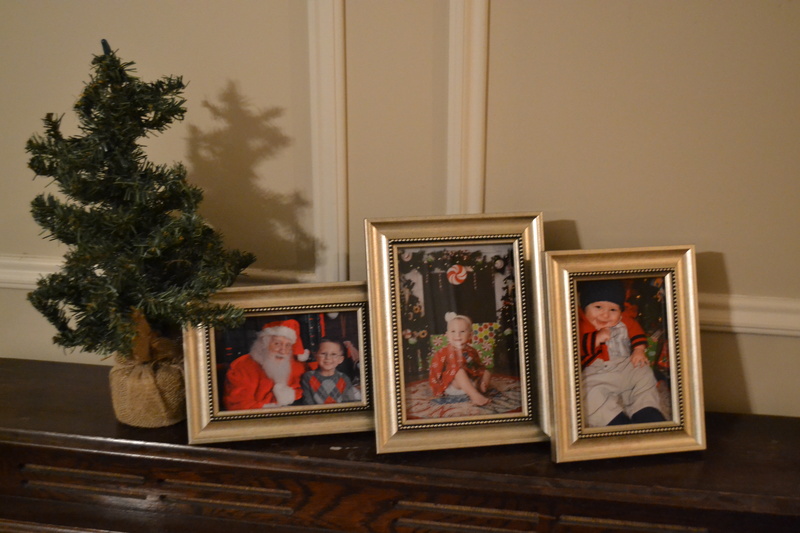 Some years we do cut outs, and other years just circles, but we always have lots of fun decorating on Christmas Eve. Here are a couple of pictures from last year! Preheat oven to 375*. In a large bowl, cream butter and sugar with an electric mixer. Beat in egg and vanilla. Add baking powder and flour one cup at a time, mixing after each addition. Dough will be stiff. Do not chill dough. Divide dough in half. Roll each half about 1/4 in thick. (Roll between 2 sheets of wax paper to help with sticking.) Dip cutters in flour before each use. Bake cookies on ungreased cookie sheet or middle rack of oven for 7-11 minutes, or until cookies are lightly browned. Now, decorate to your heart’s content! Don’t forget to add lots of fun icing and sprinkles to your shopping list. *Note: I did not create this recipe and I am not claiming to own it. I’ve been using it for several years, but I have no idea where I originally got it. If you think it’s yours, let me know, and I’ll give credit where credit is due! I love, love, love Christmas. I love the advent season, reading the prophesies and New Testament scriptures about Jesus’ birth, and reflecting on how Mary must have felt. We know the reason for the season at our house! But, I really love the fun stuff, too. I love the traditions (both religious and not), the gift giving, the decorations, the tree, etc. Today I’m just talking about the fun stuff. Once we get going with the Jesse Tree, I’ll post about the spiritual stuff. Here’s our mantle. Honestly, I’m not that great at seasonal decorating. My every day style is sort of eclectic cottage, and this is not too different from my regular mantle (which I don’t change very often). But, it has a few festive updates, like the nativity and those pine cones in the vase. Once we get our Christmas books down, I may trade out a couple of those books on the right for some red/green ones. Also, that canvas is our Christmas photo from last year. I intended to order another canvas of a picture from the beach this summer, which fits with my colors in the room better, but never got around to it (and never saw a good enough coupon). Now I’ll probably wait until I have a great picture of all 4 kids before I spend money on another canvas, but this one is nice with its Christmas-y colors. 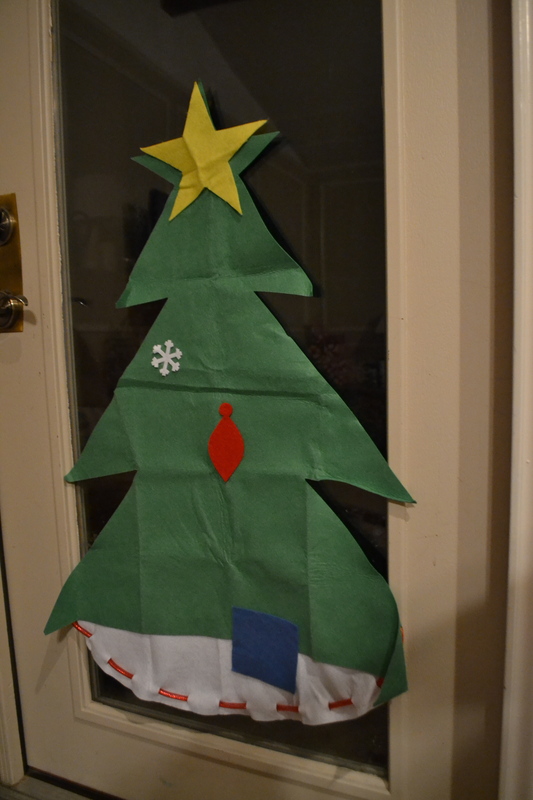 I got this little felt tree set at Target during after Christmas clearance last year, and obviously just hung it up. I hope those creases go away, I really don’t want to have to iron it! I think it would be easy to make something similar yourself, maybe even to give as a gift to a family with young kids! I know my kids will be excited to play with it throughout the next month. I decided a couple of years ago to donate/sell most of my knick-knack-y Christmas stuff and simplify my decorating with things that truly mean something to us, mainly including photographs. 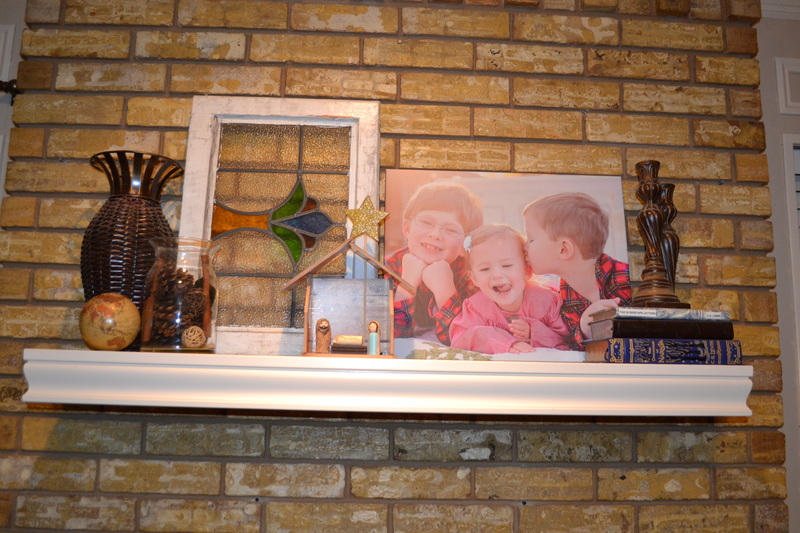 So, now I keep an eye out for silver frames on sale throughout the year and use Christmas photos from past years as our main decor. I really love it, and the kids love to see their pictures, too. Now on to gifts! My primary love language is gifts, which I know some people see as materialistic, and it is sort of hard for me to put into words why it isn’t materialistic. Maybe it is, I don’t know. I do love to receive gifts, but even more than that, I love to choose things for people that I think they’ll really love. Thoughtful, personal gifts don’t have to be expensive! I do gifts a little differently each year for Christmas. This year, we’re having a pretty practical/thrifty Christmas – both because we are penny pinching for the adoption, and because we felt like we went a little overboard last year. We want the gifts to be fun and magical, without being the main thing, which can be a hard balance to find, and I admit that we don’t always get it right! I will not put them all out right now, because I need to build a little suspense, and I don’t want them getting too curious yet. I’ll bring them out a couple at a time after we get the tree up. For now, they are in my closet, along with a bag of stocking stuffers for each of them. So far, they aren’t too bad about trying to snoop, but I know I’ll have to be a little sneakier once they’re older and taller! Some of the packages go along with each other. Like, for this year, we tried not to get too many toys, so #1 for all three kids is some bird guides, bird coloring books, and a bird feeder. (Most of the books were used from Amazon or Half Price Books and cost very little.) They’re all really into birds right now, so we’re trying to cultivate that interest a little bit. I tried to make #4 the one I think they’ll be most excited about. 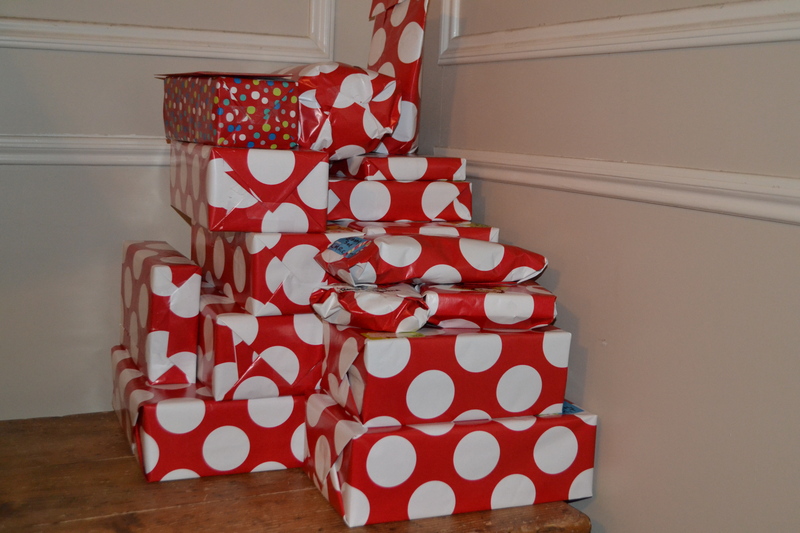 For our other gifts, like to extended family, I wrapped in all the same paper. I love this red with white polka dots and bought all of it that I could find for 75% and 90% off after Christmas last year. Looks extra cute with green curling ribbon, but I can’t add that yet, because my cat will eat it all before Christmas! They will be so cute under the tree. Here are our extended family gifts, and a couple of the kids’ gifts to each other (which they bought with their allowance and helped me wrap). So, some of you are thinking, “SHE HAS ALL OF HER CHRISTMAS SHOPPING DONE? !” Yes, I try to be done before Thanksgiving, in case I need to find something on Black Friday, and so I can start wrapping after Thanksgiving. Don’t think I’m superwoman or something – I’m not. Shopping throughout the year is fun and therapeutic for me, plus it just works better with our budget. There’s not a right or wrong way to do it! I really start shopping for Christmas right after Christmas, because that’s when there are the best deals on toys. I keep things in a box in my closet all year round, and just throw things in as I get them. If you aren’t a Target person, you have to trust me on this – I know they aren’t the cheapest for groceries or a lot of other things, but in my opinion, their Clearance can’t be beat. Most of the gifts for the kids this year are either from Amazon or from Target Clearance. So, the box in my closet gets full, and sometime around October, I dump it out and see what I have. Rarely, something I’ve gotten a few months ahead is no longer of interest to my kids – that doesn’t happen often, but if it does, I just donate that toy to a local mission for their Christmas Store. I see if I have a similar amount of things for each kids, and if not, start looking for things to fill the gaps. If I end up having too much for one child, I may save something for his/her birthday, save it for a gift for a niece, nephew, or friend, or donate it. I also don’t buy everything new. Some of you are totally turned off by that, and again, there’s not a right way to do it. But, for example, my daughter is receiving several used dance and dress up items that I got at Goodwill throughout the year. She doesn’t know or care that it’s from Goodwill, she’ll just be excited to open a box of dance and dress up things on Christmas morning, and I spent next to nothing. On Christmas Eve, we like to keep the focus on Jesus and the church service, but they are so eager that we sort of compromised on having one family gift to open right before bed. It has new pajamas for all of the kids, a Christmas-y book for them to read in bed, and hot cocoa mix and marshmallows. I also put their special ornament for the year in this family gift, and let them hang in on the tree before bed. Some years, their ornament represents a hobby or interest for that year, and other times it’s just a simple initial, etc. I keep their ornaments in their own special boxes and let them hang their own ornaments each year. That way, they’ll have special memories of their ornaments and will have a small box of their most special ornaments to take to their new home when they move out on their own someday. So, on Christmas morning this year, I’ll just see how things are going, and will tell a child to find their number 1 gift, etc, at the right time! They are also getting small gifts for each other, and we got one joint gift of a couple of (used) movies and games with an IOU for a once a month game or movie night. (My older son’s love language is quality time, so we have to be creative about touching that one, too.) Other years, I’ve figured out what order I wanted to do everything in, and have a numbered list and all of the packages numbered. Then, opening Baby Jesus for the nativity and reading from Luke would be #1, then stockings #2, breakfast #3, one child’s gift is labelled with a #4, the next child’s #5, and so on, with some fun activities mixed in. Some years planning that seems really fun to me, and some years (like this year), it seems sort of tedious, so I just let myself decide each year the way I want to do it. And, yes, we do stockings and Santa at our house. I know people have strong opinions about this one way or the other, and I don’t really want to start a debate. I respect people who choose not to do Santa, and I get it. What works for us is talking about how Santa is a fun tradition, and when they start asking questions that cannot be answered without being dishonest, we honestly answer the questions, while keeping the tradition. Stocking stuffers at our house are not big-ticket items, but their stockings are pretty full. This year, it’s things like sunglasses, gum, fun toothbrushes, joke books, a purse, chap stick/lip gloss, small Nalgene water bottles, paint, crayons, markers, a new package of underwear, etc. Some fun things and some practical things. I shop for this stuff throughout the year, too, and throw it in the same box as the other stuff to organize before Thanksgiving. School supply clearance is great for stocking stuffers! If anyone took the time to read/skim all of that – tell me how you save money on gifts at your house? How do you organize gifts on Christmas morning? What fun traditions and decorations does your family use to get in a festive spirit? In the China adoption world, people spend a lot of time talking about all the different wait times. Honestly, it is all very confusing to me, and I don’t really keep up with the numbers. One thing I do know, though, is that we’re on day 30 of our “LOA wait.” The average wait for LOA (Letter of Acceptance from China) seems to be around 60-70 days, so we’re about halfway there! I’m trying not to have expectations, but also sort of thinking it would make a nice Christmas gift. Speaking of Christmas, it is my favorite time of year! I can’t wait to put the tree up. We’re doing the Jesse Tree this year, and I’m really excited to get started on it. My MOPS group did a swap to make the ornaments, and I think it’s really neat that I have handmade ornaments from my dearest friends who have walked beside me through this crazy season of my life. What a special keepsake to have. I will probably post about the Jesse Tree again, but if you’ve never heard of it, check out Pinterest and see some of the ornaments. I haven’t been great about doing advent with the kids, but I’m hoping this year, we can all be deliberate about preparing our hearts for the Savior! 30 days from today will be December 21. Stay tuned!